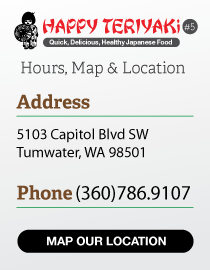 Happy teriyaki in Tumwater, WA 98501. We invite you to make reservations and join us for your next dining experience. We always serve the freshest ingredient straight from the market. Call us today to experience the spirit. 2 tempura prawns, 2 egg rolls, 5 pork gyoza. 7 Deep-fried pork dumplings served with our special gyoza sauce. 2 pork and vegetable eggrolls deep-fried. Served with sweet & sour sauce. 4 Crispy vegetable spring rolls deep-fried and served with sweet & sour sauce. 4 Crispy wontons served with sweet & sour sauce. 3 fileted, hand battered deep-fried prawns, served with our special tempura sauce. Generous portion of crispy onion rings served with ranch. Steamed immature soybeans in the pod. Healthful and good source of protein.